Bird Feeder Poles with Bird Feeders come as complete systems and are ready to attract wild birds to your backyard. Most poles already have excellent Squirrel Baffles or Raccoon Baffles below which automatically makes them a squirrel proof bird feeder pole. If you are not sure what poles or feeders you need, these systems are a great way to get started. The Bird Feeder Poles Systems vary by type and size from 2" diameter main poles to 1" diameter main poles and Wrought Iron Shepherd Staffs. The Bird Feeder Pole systems below offer cost savings by buying as a complete unit instead of individual purchases. Need help? See our Bird feeder FAQ, placement tips and ways to have Squirrel proof bird feeders here. Bird feeder pole kit has a Squirrel Stopper Pro bird feeder pole with three different types of bird feeders. Makes an excellent bird feeder pole system to attract all kinds of wild birds. The ultimate Bird Feeder Pole system on a Squirrel Stopper Pole. It's Bird feeders are designed to attract the most song birds while the bird feeder pole system keeps them squirrel and raccoon proof. Bird Feeder Pole with classy metal domes and two types of best in class bird feeders on a great foundation of the Squirrel Stopper Pole. This bird pole baffle is squirrel proof and raccoon proof. This Bird Feeder Pole is a very stylish squirrel baffled bird pole system with three hanger arms, and 3 copper tint baffle domes. This Squirrel Proof Pole is one classy looking system. Bird Feeder Pole System with two hanger arms, versatile perching branch, cylinder squirrel baffle and glass all purpose dish. Very functional Squirrel Proof pole. Bird Feeder Pole System E7 has a double hanger arm on top with a twist on third hanger arm and bird bath below. This bird feeding pole is a complete system and ready to enjoy with your bird feeders. Squirrel Proof Bird Feeder S-Pole has 2 hanger arms with 2 brushed copper bird feeders, a cylinder squirrel baffle, and ground socket anchor. Bird feeder S-pole Series has unique slot and pin joints to secure all connections. Bird Feeder S Pole Squirrel Proof System has 4 hanger arms with 4 brushed copper bird feeders, weather baffles and a cylinder squirrel baffle for poles. This complete squirrel proof bird feeder system really shines with copper feeders. Bird Feeder Station Pole Kit is a medium duty 6 ft Bird feeder pole with 10" double hanger arms, single hook arm, water disk, mesh feeder tray and two copper electroplated top and bottom bird feeder mini pair. Includes a full size 18" cone baffle to block squirrels. Goldfinch Bird Feeder Pole Station with 2 yellow weather guards, a spiral thistle Goldfinch bird feeder, and a thistle sock. The 6 ft tall Pole system includes a mesh tray, extra hook and water bowl. Hummingbird Feeder Station a 2 Arm Pole Kit makes an ideal Hummingbird pole and includes two 10 port Hummingbird feeders. The two Hummingbird feeders have a built in ant guard on top and their large capacity feeder each holds 16 oz of nectar. 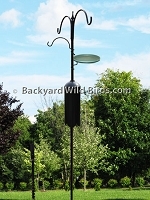 Bird Feeder Station 3 Arm Pole is a perfect 6 ft Hummingbird Feeder Station pole that includes two Hummingbird feeders. The 3 arm pole is great as a Hummingbird feeder pole and has an extra arm to add your own. Wrought iron Shepherd Staff bird feeder pole that has double hanger arms and a 17" cone squirrel baffle to stop squirrels, just what a bird feeder pole needs. Pole uses 1/2" square steel. Tall Bird Pole Rack System is 16.5 ft tall and includes a cross bar rack, 2" square tube steel pole, winch and ground socket. The winch ratchet makes raising and lowering the rack easy. Great for high viewing of bird feeders, Deer proof bird feeders or hanging 8 Purple Martin super gourds. Classy wrought iron pole is an adjustable height Shepherd Staff pole with 17" cone squirrel baffle and Copper tint weather guards for bird feeders.